In just a few months since my October 2014 article, the price of my service increased an additional $6 bucks; part of this is from the made up "Broadcast TV and Sports Programming" fee going up 144%, another from an increase to the cost of the cable Internet modem, and then we have additional taxes, fees and surcharges that truly are "nickel and diming" us. Thus, the advertised price of $89.99 for a Time Warner Cable standard, no frills Triple Play in Brooklyn New York now cost $196.72, an increase of 119% above the advertised price. And while there are those who would say go buy a modem and cut the cord -- maybe it's time to confront this and say -- enough is enough. And for those who say, well, the new net neutrality order will fix everything, (assuming it makes it through various, expected court battles), I'll detail a few of the good things about the order as it relates to these charges, then give you the reality -- it doesn't fix most things. Below are the details of the increases, just so that you can "feel the pain"; the numbers correspond to the Graphic of Gluttony over the last two+ years. 1) You can never get the advertised $89.99 price -- ever. The total original price came to $114.06, adding 27% more to the advertised price. 2) The increased total bill so far is $196.72 -- 119% increase above the advertised price. 3) The Internet modem alone went up 108%, increasing since my last article to $8.00 a month (up 34%). While the techies say, go buy one, the average person wouldn't know where to start, and probably never reads the details of their bills to figure out what items went up, or that you can even buy something else. And Time Warner Cable doesn't recommend replacing the set-top box provided, and who even knows the difference between the boxes the company attached to provide service in the first place? 5) This is on top of the "Regulatory (cough, made up) Fee". This is made up because it should have been added to the total the cost of doing business, instead of the creation of a new revenue bucket. 6) There are multiple "pass-through" taxes and fees, including the "excise" taxes, as well as the franchise fees -- taxes or fees imposed on the company that they pass through to us. And since they applied taxes to the most of the services, almost all of them continue to rise. 7) My personal favorite are these two excerpts from the bills telling me how much I saved off of the retail price. The top is from May 2012, the bottom is March 2015. If my bill went up 119% how exactly do I enjoy the $28.20 I'm saving when I had the original $89.99, and I was saving $29.66, about $1.46 more savings? And I note this obviously refers to the "savings" of buying more than one service as compared to buying each service separately. 8) Let us not forget the set-top box, which is an additional $11.25 a month. (It used to be included in the cost of service.) Note that the company states you should not consider using another brand that is not supplied by TWC, and you can't find this out unless you read their 20+ page subscriber service agreement. "If you choose not to lease a set-top box from us, you may be unable to view all available channels for the tier of Service you receive or to perform certain two-way operations." 9) And another seemingly made up fee is the Public Access Fee, which went up from $.98 to $1.37 -- an increase of 40%. 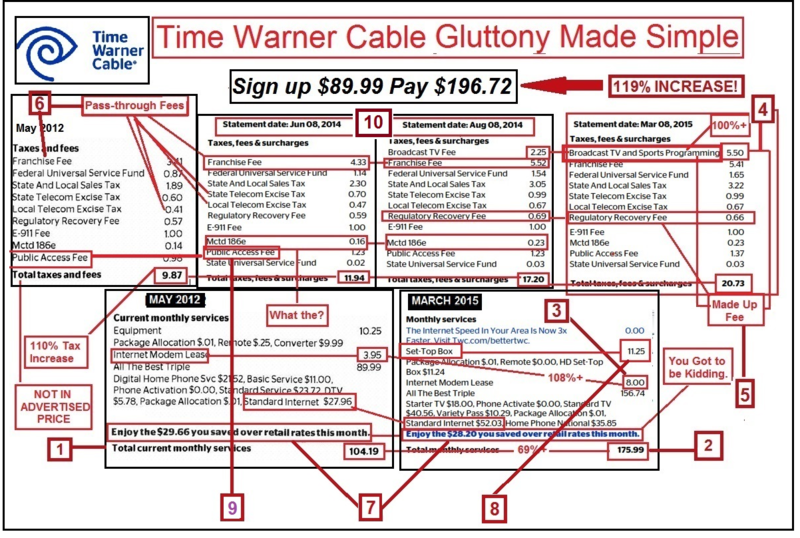 10) NOTE: We added two additional months of the taxes, fees and surcharges section to the Graphic of Gluttony to show the major, quick additions to the bill, but more importantly, that it was done incrementally so as to not really get people pissed off enough to call to find out what happened. From June 2014 to August 2014, there was an additional "Broadcast Sports fee" added at $2.25, and other additional charges, which made most of the taxes increase incrementally adding $5.20 extra a month. 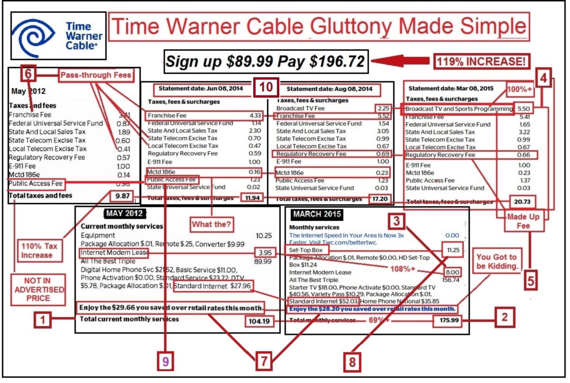 And the math on this -- at the current $5.50 a month for the Broadcast & Sports Programming fee, and with 10.8 million TWC cable customers, (TWC 2014 Annual Report) the company gets about $60 million a month extra or $720 million a year from this one fee. The order actually addresses some of communications bill issues pertaining to disclosure. NOTE: We will be glad to take some credit for this as we've not only been filing about these issues since 1993, but more recently, our marked up bills received some attention. "Price -- the full monthly service charge. Any promotional rates should be clearly noted as such, specify the duration of the promotional period, and note the full monthly service charge the consumer will incur after the expiration of the promotional period. "Other Fees -- all additional one time and/or recurring fees and/or surcharges the consumer may incur either to initiate, maintain, or discontinue service, including the name, definition, and cost of each additional fee. These may include modem rental fees, installation fees, service charges, and early termination fees, among others. "Data Caps and Allowances -- any data caps or allowances that are a part of the plan the consumer is purchasing, as well as the consequences of exceeding the cap or allowance (e.g., additional charges, loss of service for the remainder of the billing cycle). "To be clear, these disclosures may have been required in certain circumstances under the existing transparency rule in order to provide information sufficient for consumers to make informed choices. Here, we now require that this information always be disclosed." Simply put, when I signed up for the Triple Play plan the company would have had to supply information about all of the charges on the first bill as well all of the expected increases after the promotion ends. Of course, after year one or two, or even six months, there could be rate increases that were not included at the time and these would impact all taxes fees and surcharges applied. But this is a start. While we will be informed about how many ways they are screwing with us in advance, it doesn't fix most of the problems. It doesn't remove the made up fees or make them part of the cost of the advertised price. It doesn't stop the pass through fees, which include the excise taxes or the franchise fees. It doesn't say that the advertised "never can get" rate will be the total costs that you actually pay vs they can simply "disclose" the total costs somewhere on the web site, etc. And it doesn't bring in competition to lower the rates. But the kicker is -- knowing how they will screw you beforehand doesn't really help if there aren't any other choices for primary services like high-speed Internet. No Rate Regulation: And this is Good because...? The regulation of rates is supposed to be used when there is no competition and the rate of a service keeps escalating. But, Chairman Wheeler tells us that there will be no "rate regulation" in the current net neutrality plan. "Chairman Tom Wheeler shouts 'No, no, no, no!' The new regulations won't dictate carriers' rates, impose tariffs or meddle with their business." This translates into -- Let the company continue to raise rates without constraints, as there is no competition to keep prices in check. Let the FCC's "Captured" Consumer Advisory Committee do the Guidelines? Yikes! One final caveat. The FCC has decided that the FCC Consumer Advisory Committee (CAC) should create the new standards and guidelines. "We seek the advice of our Consumer Advisory Committee, which is composed of both industry and consumer interests, including those representing people with disabilities. We find that the Committee's experience with consumer disclosure issues makes it an ideal body to recommend a disclosure format that should be clear and easy to read--similar to a nutrition label--to allow consumers to easily compare the services of different providers. We believe the CAC is uniquely able to recommend a disclosure format that both anticipates and addresses provider compliance burdens while ensuring the utility of the disclosures for consumers." Scandal Ridden: Did you know that Verizon has been the longest standing member of this Committee since it's inception and that it is packed with industry players, including Time Warner Cable, the cable association, NCTA and CTIA, the wireless association? Moreover, many of the consumer groups receive money from Verizon, AT&T and/or the cable companies. I'll address the "Consumer Advisory Committee" in detail in an upcoming article, but the bottom line is -- the CAC is a stacked deck and if you think that Verizon, Time Warner Cable, the cable association and the wireless association are going to deliver changes to your bills... stop laughing. And I'll be coming back to the good, bad and ugly of the order, though it will probably by moot as most of us are waiting to see the volley of legal actions about to descend on the FCC, so it all may be held up in the courts for years. To understand how we ended up in this mess see: "The Book of Broken Promises: $400 Billion Broadband Scandal & Free the Net"